Property Size 991 sq. ft. 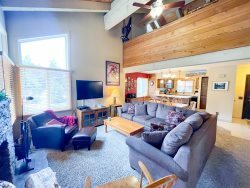 Above Standard, Nicely Upgraded, One Bedroom with Loft and Two Bath Condominium walking distance to Canyon Lodge Ski Lift area in Mammoth Lakes. There is 1 Queen Log Style Bed in the Bedroom and 2 sets of Log Style Bunk Beds in the loft. There is a Leather Sofa in the Living Room with a Twin Sofa Bed . 2 Flat Screen TVs (Living Room & Loft) 2 VCR`s. Wifi Internet Access in the unit. Netflix enabled DVD player. Unit phone number 760-934-8242 (1050 sq. ft.) Mountain Style Decor with Hardwood Floors. First floor is the Bedroom, Kitchen, Dining Room, Living Room and 1 full Bathroom. The second floor is the Loft and the 2nd full Bathroom. The Loft is enclosed except for the stairwell area. This is an upstairs unit...you enter the unit from an enclosed hallway in the Chamonix C Building. There are two outside parking spaces available. Recreation room with large screen TV, reading area, ping pong, foosball, and business center with fax, copier, computers w/ internet and laptop hook-up. Sauna, hydro spas, seasonal/summer swimming pool & BBQ area. Coin-operated laundry facilities located in the common area near the office. COMPLIMENTARY INTERNET and CABLE TV are provided, however NO REFUNDS will be given for connectivity problems or Internet failure. The unit has a gas fireplace that is not wood-burning. TOT LICENSE 1968-CX60. This lodge was very accommodating and about a 10 minute walk to canyon lodge slopes. Location was ideal and we didnt have any trouble finding the place. Great location next to Canyon Lodge! Warm, cozy home. We really enjoyed our stay- the condo is small but very clean and has everything you need for a weekend getaway- fireplace, comfy couch, and a nice kitchen. Easily accommodated a group of 5 adults, 1 kid. Located walking distance to Canyon Lodge. Hot water did run out every night so I recommend staggering your showers- other than that wed definitely stay again! We had a great time for the weekend we spent at this condo. A short walk from the slopes, this property was ideally located. The check-in and check-out was easy and carefree. We had a great time during our week long stay at Chamonix c60. Everything was just as promised and keys were waiting for us when we arrived. We will definitely be planning our next Mammoth vacation through one of your properties. Thanks! Nice and clean. Walking distance to Canyon Lodge. The apartment was clean. The beds were comfy there were lots of clean towels. Kitchen was great. Location was perfect it was an easy 5 minute walk for us and the kids to Canyon Lodge. Wed stay there again. Thanks for the place to stay. Great location to the mountain. Also had a great dinner across the street at the German restaurant. Cozy condo with nice decor and wonderful wood burning stove :) Perfect for our family. This was an excellent vacation rental. Convenient to the slopes and had all the storage and cooking tools needed to stay comfortably. Highly recommend. This place is located just within a short walk to Canyon Lodge. It was excellent for our ski trip! The loft is bigger than it looked in the pictures. Great for accommodating our group of six. Recommended! Would definitely stay here again. Very nice! Probably the best experience I had in Mammoth. Enough said~ Thank you, you guys were awesome! Second stay in this complex. All the snow made it a little harder to find parking near our unit but we worked it out. Great stay! This place was perfect for a group of 6 friends! Walkable to shuttle stops, AustriaHof, and Canyon Lodge. Jacuzzi under snowfall was divine. Fireplace kept us toasty warm! My group and I had so much fun in this condo. It was very cozy, clean, and super close to the lifts. We definitely want to come back and stay again! We had such a good time. This was a very easy check in and check out. Great place to stay if you are boarding at canyon lodge in Mammoth. It takes about 5min to walk to the lifts, which is also great when using the gondola to village. I didnt get to use the rec center but it looked like other guests were enjoying them. Just like every other reviews, it was very clean and cozy. The owner was quick to respond to any questions I had. Would stay here again if given the chance. A wonderful apartment for a wonderful stay! The apartment is very well designed, the host provides everything that you need. You even have firewood available to spend lovely nights next to the fireplace. The apartment is really close to the ski slopes and all the hiking trails. We had a wonderful time there! The condo was very clean and well kept. The host was helpful and straight forward. The condo was beautiful! It was stylishly decorated and comfy at the same time. Everything worked and we needed nothing in terms of kitchen items. The location was excellent and only a 1 minute drive to the slopes. Too far to walk In ski boots but a boarder could do it. Loved the place and will come back again for sure! The description was accurate and the place was welcoming and clean. The location is awesome, 5-10min from Canyon lodge. Hot-tub and sauna are great too (though the sauna was a little cold on the first day). The kitchen and appliances are great. Amazing condo... Everything worked great in the condo including wifi, hot water, and appliances. Decorated nicely and plenty of space. Very close to slopes. Id come back for sure. The condo was perfectly located near Canyon Lodge, which made running back to check on our infant easy! We loved the fireplace and the updated kitchen and bathroom. The unit was on the smaller side, but it worked well for 3 adults and a baby. We would definitely consider staying here again. The hosts were very easy to work with and responded quickly to my requests and questions. The family thoroughly enjoyed the condo. Cleanliness and how accommodating the staff was to assist us. Its a nicely upgraded unit & excellent location. We will be staying in that same unit later this month. Great stay and wonderful place. Really one of the best places my family and I have stayed in at Mammoth! Loved it. And priced well!